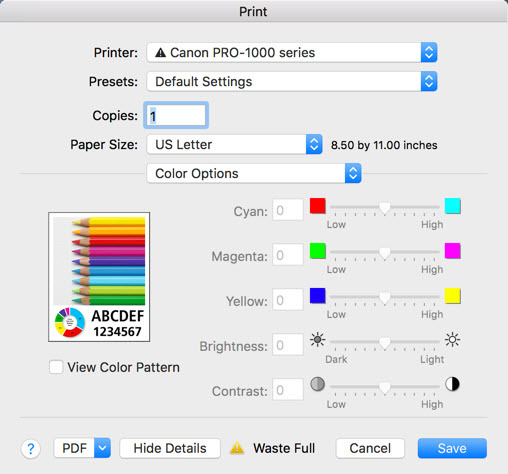 Color profiles are pieces of software that bypass your printer color management in an attempt to reproduce better color gamut and print quality for a specific paper, printer and ink set. If you are unfamiliar with profiles or Photoshop, read all support documents carefully before beginning. In this tutorial, we are allowing Photoshop to manage the colors. Your printer color systems are being turned off. 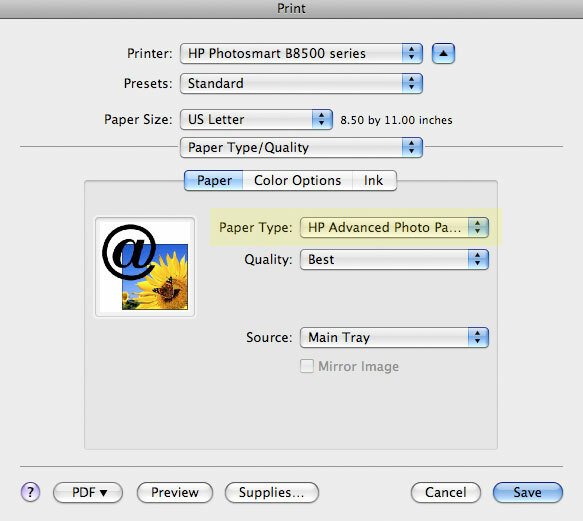 When you are ready to print, choose File > Print (Command +P) and the Print dialog will appear. 3) Select rendering intent – Relative Colorimetric or Perceptual. We recommend Relative Colorimetric. Your screen may look different! Each printer driver may be set up with different drop down menus and even different control options. However, all Epson printers come with the functions you need - set the media type, print quality, and verify color management is turned off at the driver level. 2) Set the media type based on your profile’s instructions. Note: The name of the Red River paper you're using will not show up in this drop down menu. 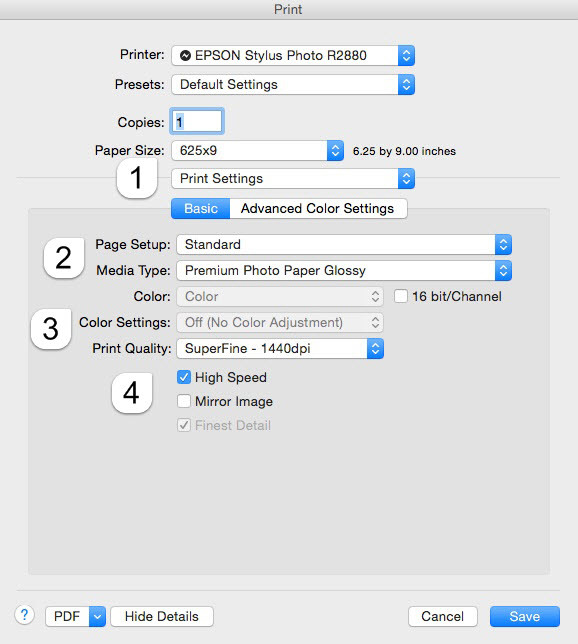 3) The OS will automatically disable the printer's color management - the box is grayed out. 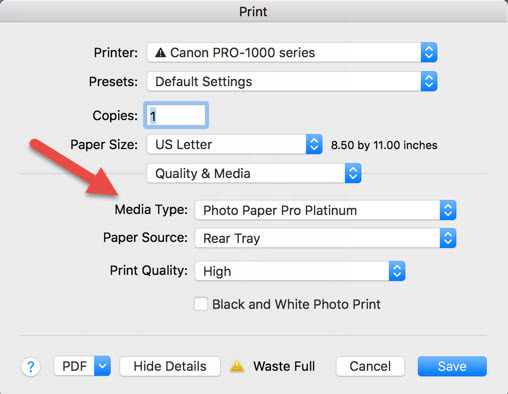 4) Print Quality - Look for "SuperFine" or "Photo" options. These are recommended for best quality, speed, and ink economy. 1) Set the media type based on your profile’s instructions. 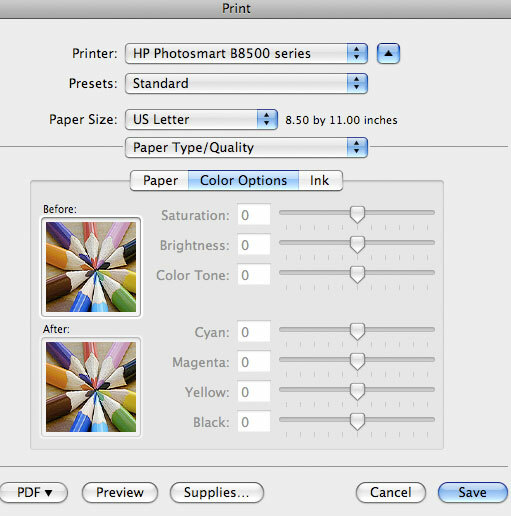 2) The Mac OS will automatically disable the printer's color management. Now click on the Color Options drop-down menu (see below). In the Color Options menu the Color Mode should be grayed out. Verify your other quality settings and click Save. 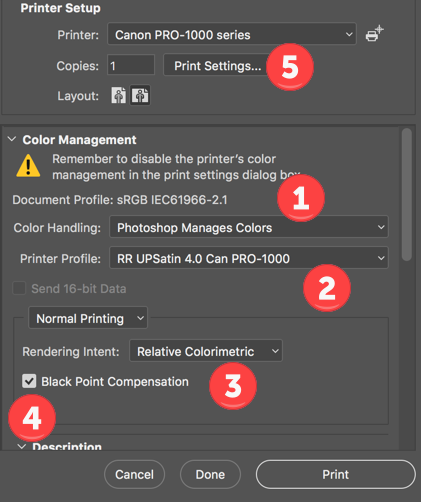 When back at the Photoshop print menu you can click the Print button. Now click on the Color Options tab (see below). On the Color Options tab, all controls should be grayed out. This indicates that Photoshop is managing the colors.